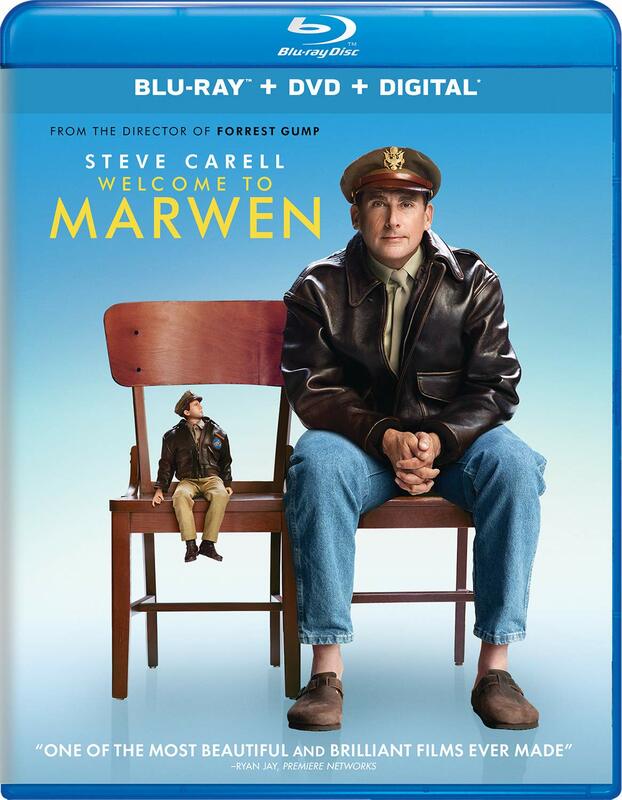 SYNOPSIS: Academy Award winner Robert Zemeckis (Forrest Gump, Castaway) brings Welcome to Marwen, a bold, wondrous and timely film that is a miraculous true story of one broken man's fight as he discovers how artistic imagination can restore the human spirit. When a devastating attack leaves Mark Hogancamp (Steve Carell) shattered and without his memory, no one expected recovery. But by putting together pieces from his old and new life, Mark meticulously creates a wondrous fantasy world, where he draws strength to triumph in the real one. His astonishing art installation becomes a testament to the powerful women who support him on his journey. After spending a decade making motion-capture movies liked The Polar Express, Beowulf and A Christmas Carol, Robert Zemeckis’ return to live-action filmmaking is a mixed bag at best and his third feature, Welcome to Marwen is unfortunately yet another mishap. Welcome to Marwen is based on a true life story of Mark Hogancamp, a man who suffered memory loss and PTSD as a result of a brutal assault outside of a bar after admitting to a bunch of men that he is a cross-dresser. Subsequently after spending time in the hospital, Hogancamp begins to work on his art installation which started with World War II-era towns and dolls to help cope with the aftermath of his traumatic attack. Comedian turned dramatic actor Steve Carell (Foxcatcher, Beautiful Boy) plays Hogancamp, the man who daily surrounds himself with fictional characters in his miniature village called Marwen. Imagining himself as Captain Hogie and together with his bunch of gung-ho female warriors, they take on evil Nazi soldiers and Deja Thoris (Diane Kruger), the green haired witch. Zemeckis who also co-wrote the story attempts to tell a story of a broken man who somehow manages to find a way to slowly heal himself via an unorthodox manner. Of course, Zemeckis is a man capable of telling a compelling story (just look at Back to the Future and Castaway) but Welcome to Marwen strangely lacks the heart and soul to pull you into Hogancamp’s world. Instead of focusing more on the humans, Zemeckis is pretty much contend in constantly reverting to Hogancamp’s imaginary plastic world which overwhelmed the entire main theme. Interestingly, Gwendoline Christie (Games of Throne) has only one single scene as Hogancamp’s Russian caregiver. Merritt Weaver (Denise from The Walking Dead) plays Roberta who sort of unconvincingly ended up as a love interest while working in a hobby shop which Hogancamp frequents. Most glaring of all is Leslie Mann who plays Hogancamp’s neighbour who has a stalker ex-boyfriend, a character that brought nothing to the table except being a potential wife material for Hogancamp. Steve Carell proved he is a versatile, superb actor portraying a complex, disturbed character in a perplexing script. Welcome to Marwen ends up neither being sentimental nor profoundly touching on the subject matter. The entire flick feels like Zemeckis is still struggling to get back on his feet on live-action filmmaking although I must admit the visual, imaginative world of Marwen has far more excitement ongoing with armed creepy dolls on stilettoes and the always welcome DeLorean makes a grand cameo in the finale. Extras include 11 minutes of Deleted Scenes, Marwen’s Citizens takes a look at the key characters and A Visionary Director delves into the qualities of the director. The most interesting features however belonged to Building Marwen and Living Dolls, the former focusing on the beautifully constructed miniatures sets and the latter on the digitally constructed dolls. Despite not being an action movie, Welcome to Marwen delivers a solid, robust soundtrack that will rock your household during the gun firing sequences that happened in Mark’s imaginary world. Details are dynamic in both imaginary and the real world while skin tones appear natural. All in all, an almost perfect audio and visual presentation.